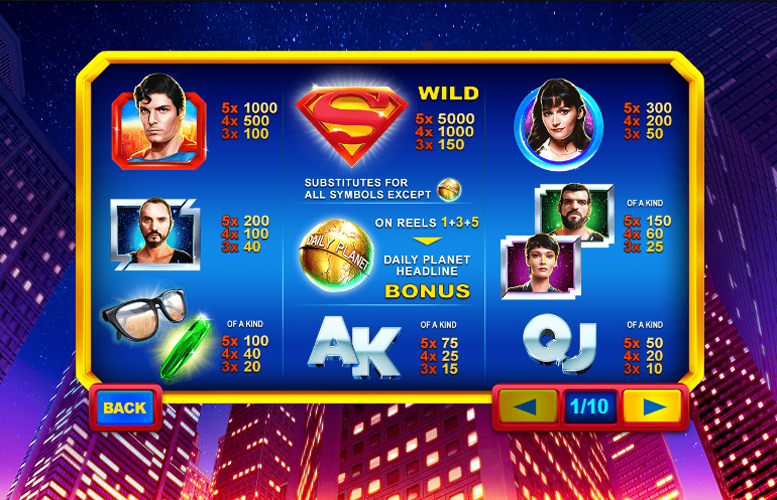 The Superman II slot machine from Playtech is one of the most feature-packed games we’ve ever tested. 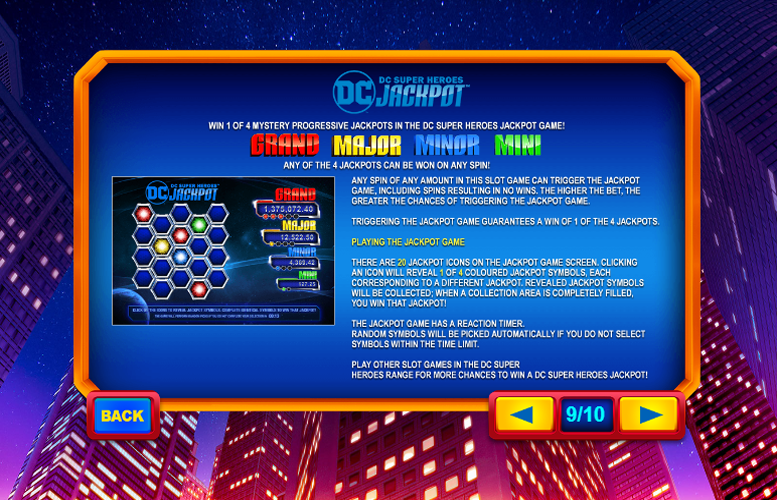 There are several different bonuses, multiple free games modes, and a progressive jackpot mode. 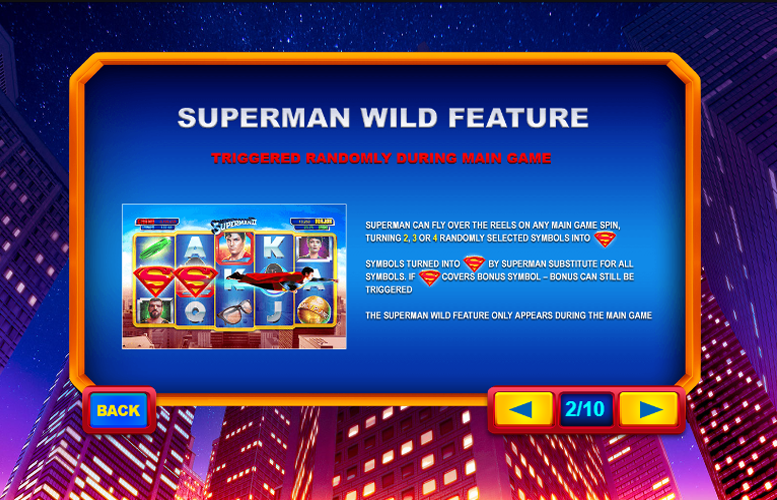 This means that replay value is strong, and the title even holds appeal for those who are less interested in the Man of Steel and just love a great slot machine experience. Extremely low upper betting limit. Superman logo “wild” = 5,000x the line bet. Superman = 1,000x the line bet. Lois Lane = 300x the line bet. General Zod = 200x the line bet. Ursa or Non = 150x the line bet. Glasses or Kryptonite = 100x the line bet. This is triggered randomly during the main game. During this feature, Superman will fly over the reels turning two, three, or four randomly selected symbols into Superman logos. These will then substitute for any other symbol. Players should note that this feature can only occur during the main game. Players must fight the villains from Krypton over the rooftops of Metropolis. They must pick one of the shields during each stage of the bonus. Each shield will reveal a cash prize, a special item, or a “collect” symbol. The “collect” symbol terminates the feature and the player is awarded any prizes they have received up to that point. Finding kryptonite can cancel the next “collect” symbol found. Kryptonite is stored until it is needed. There is also an “X-Ray Vision” symbol hidden under the Superman shields. This will reveal all the symbols and automatically awards the top prize possible. This bonus is an unlimited free games round. During the feature, a “phantom zone” will appear on the reels. It’s a 2×2 sized area that will act as a “wild” symbol. 2x = multiplies any winnings on the current spin by 2x. 3x = multiplies any winnings on the current spin by 3x. Countdown timer = ends the free games and awards any accumulated winnings. Superman logo = are stored up and used to cancel the next countdown timer that appears on the reel. Players should note: The free spin mode cannot be retriggered. 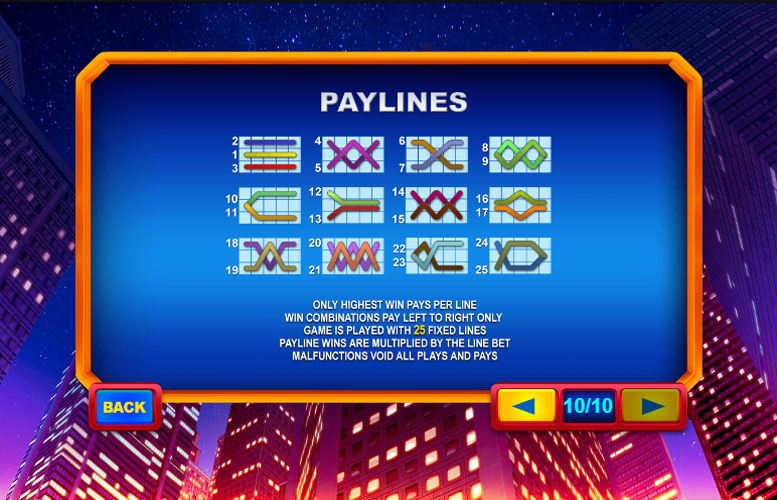 Players are awarded ten free games with a starting multiplier of 1x. If the Superman symbol appears anywhere on the third reel, the free games countdown stops, and the free games become limitless. After this, additional Superman symbols appearing on the third reel will increase the multiplier by 1x at a time. The maximum is 5x. If the Zod symbol appears on reel three, the multiplier is reset to 1x and the free games counter will resume counting down. Like the other free games modes on Superman II, this feature cannot be retriggered. Players are awarded 15 free games. Landing the X-Ray Vision symbol anywhere on reel three transforms it into a Superman logo and adds two additional Superman logos on reel two and reel four. This can make for some substantial prizes. Players are presented with a board of shields. They must keep picking the shields until they match five of the same colour. Once all the shields of a single colour are selected, the corresponding prize is awarded to the player and the bonus will end. In addition, there are two other symbols hidden amongst the shields. The Superman logo will add a symbol to each of the four levels and the upwards pointing arrow will double all available prizes. Finally, there is a randomly triggered progressive jackpot mode. It’s played in the same way as the Lois and Clark bonus. Any single spin can trigger the feature, but players should note that higher value bets are more likely to activate the bonus. There are four different tiers of prizes to win and one must be won on every visit to the DC Super Heroes Jackpot side game. Ace or King = 75x the line bet. Queen or Jack = 50x the line bet. The number of win lines is fixed at 25 on Superman II. That means players are only able to adjust the amount they wish to bet on each line. The minimum is just 1p and the maximum is a rather lacklustre £1. This means that the lowest possible bet per spin is 25p. Meanwhile, the highest wager a player can make on a single spin is a very underwhelming £25. Not only will many high rollers be put off by this, but some mid stakes players will also find it overly limiting. 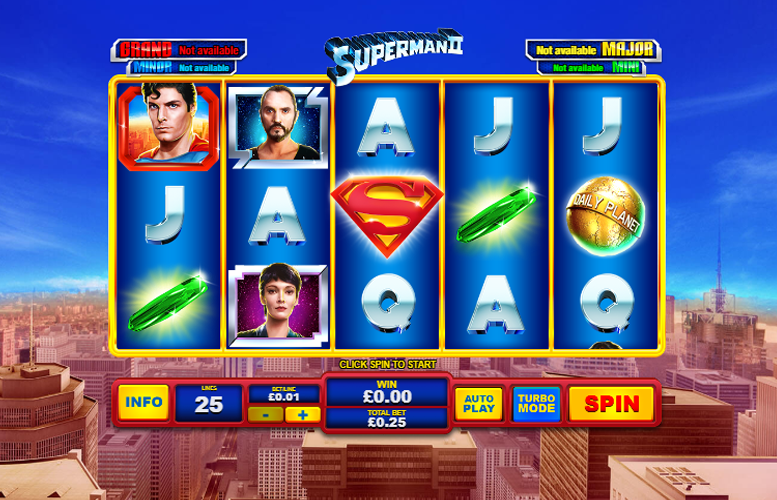 Thanks to its staggering number of special features, the Superman II slot machine is one of the best machines we’ve ever reviewed. It might lack in the animation department, but it makes up for it with the variety of bonuses on offer. There are numerous free games modes and players have the chance to win a lifechanging sum of money thanks to the DC Jackpot feature. If the upper betting limit was a bit higher, Superman II would get our first ever perfect score. This game has a rating of 5 / 5 with 728 total reviews by the users.